Have you ever wondered how this shiny cover on professionally made cakes and tartes is achieved? 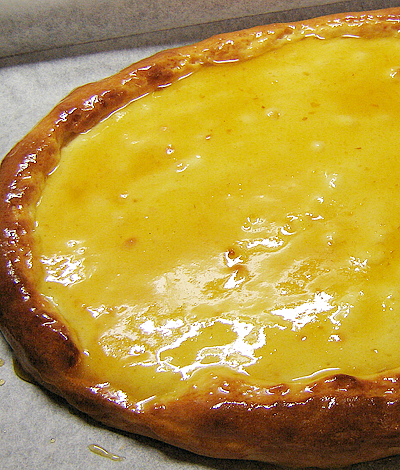 This simple and delicious glaze comes from France and there it is called abricotage. I'm a bit addicted to this glaze. It does not only look gorgeous, it prevents the cake from drying out, keeps fruit fresh and with its slightly sour taste it adds that little kick to an otherwise bland thingy. There are lots of time consuming recipes around of how to make it from fresh apricots. I've never done that. Fresh apricots with lots of flavour are hardly available here. You better get the best quality apricot jam or confiture on offer and start from there. Pour a complete jar of shop bought apricot confiture into a bowl. Purée it in a food processor or with a hand mixer with a chopping blade attached until it is completely smooth and without any bits or pieces. It will look a bit milky at that stage due to all the tiny air bubbles being trapped. Don't worry about that. Put the purée back into the jar, close and store in the fridge. It stores for several weeks due to its high sugar content. 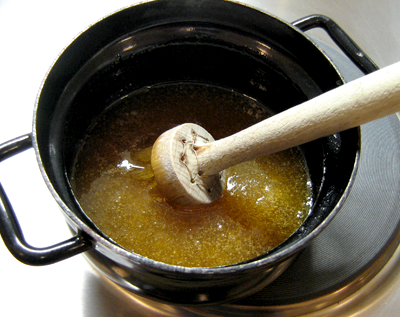 If you want to glaze something, just put a few spoons full of jam into a small pot, add a little water or rum and bring it just to the boil. Don't add too much liquid, it will become thinner when getting hot anyway. If it gets too thin, you can't apply it without running. With a cooking brush apply the hot glaze to the hot cake or cookie. It will dry very fast and leave a shiny surface. If you want to cover fresh fruit on a cake, of course you wouldn't heat the fruit. But the glaze always has to be as hot as can be when applying. That's it! Try it – you'll love it.